What if you could have your beautiful landscaping and eat it too? Imagine a world where our landscapes were filled with a diverse array of useful plants, from nut producing trees in the overstory, to fruiting trees, shrubs, vegetables, and ground covers. Imagine if a walk down your neighborhood street was a full sensory experience, bursting with life, scents, fruits, colors, and flavors. Imagine what the urban and suburban environment could look like if we turned it into a food and medicine producing oasis rather than the homogenized landscape of lawns, boxwoods and laurel hedges that often surrounds us! For over 20 years One Green World has provided the plant material to make this vision a reality, and we are very excited to now be providing edible landscaping services to help you turn your backyard into a flourishing edible landscape. It can be overwhelming trying to choose which plants will do best in your location. With hundreds of varieties and species to choose from, coming up with a design that is perfect for your landscape can prove challenging. Our landscape designers create custom designs for your property, that fit your needs and aesthetic preferences. Having an edible landscape doesn’t mean you have to give up your aesthetic goals or desired landscape functions. Get a beautiful, functional garden today. We understand that most people want a landscape that still maintains a sense of beauty and openness and fits in with the landscapes around them. Thankfully we have many edible plants that also function equally well in the ornamental landscape. Replace that laurel hedge with a pineapple guava or silverberry hedge! Get rid of the azaleas and put in some evergreen huckleberries! We work with our society’s current landscape aesthetics to create a human habitat that is both beautiful and edible. Or if your idea of a beautiful landscape is a thriving food forest that is bustling with life and ecological synergies and you could care less about currently accepted landscape aesthetics, we are more than happy to work with those design parameters as well. We live in an incredibly unique climate here in the Pacific Northwest with an equally unique cast of botanical characters that we share it with. Incorporating these plants into your gardens has many advantages. You will likely not have to water these natives much if at all. They provide habitat and food for wildlife and they are incredibly low maintenance as they are already well adapted to this climate and these soils. One Green World has always carried a diverse range of native plants, specifically those that have an edible or medicinal component to them. Our philosophy when designing landscapes is to look to native plants first and if they cannot perform the function we are looking for then we look to other plants to fulfill that function. Quite often native plants do not fulfill our human needs for food production as well as introduced or cultivated species. Therefore we often find ourselves using a small number of native plants, but we always look to the native plants first. Most importantly we feel that the native plants of the Northwest, as well as native ecosystems as a whole, are invaluable tools for informing our designs. We are constantly going back to the source to look for inspiration and ideas from wild nature that we can incorporate into creating and designing our human habitats. We believe that we can do more to save our wild lands by taking responsibility for our human needs than we can trying to recreate intact ecosystems in landscapes that are inherently going to be disturbed. By producing the food, fiber, and fuel necessary for human life on the home scale we can limit the amount of land that needs to be logged or farmed and return it to wilderness. That being said, we are happy to work with native plant enthusiasts to design gardens that work well for their needs as well as the needs of wildlife and promote the intrinsic value that native plants have to offer us. For a comprehensive resource on Northwest natives, check out Plants of the Pacific Northwest Coast by Pojar and MacKinnon. The ethnobotanical notes in this book on indigenous peoples’ uses for these plants is incredible. When was the last time you walked into the grocery store and saw seaberries, shipovas, paw paws, heartnuts, goumis, or actually ripe figs in the produce section? How often have you been disappointed by a fruit that was obviously picked unripe before it was shipped to you? The home landscape is the perfect place to grow these rare and unusual fruits, or common fruits that have to be eaten fresh and truly ripe to really taste their best. We have been doing ourselves a great disservice by planting flowering street trees that produce no fruit when we could be treating ourselves to some of the finest flavors and nutrient dense fruits that nature has to offer. We offer installation services for all of our designs. There are many advantages to having our skilled installers plant your trees, build your raised beds, or install your trellises. It can be an educational process as well as an installation. Maybe you’ve never planted a bare root tree before, or built a large raised bed or grape trellis. Our expert installers will make sure your trees are planted in the best way possible to provide a long and healthy life for your new fruit trees. We are happy to have you present when planting or installing so we can teach you how to do it yourself. We always use organic practices and materials as we have found this to be the healthiest way to nurture your soil and grow resilient and healthy plants. Whether you need a commercial orchard planted, a small urban backyard rejuvenated, or anything in between, we can help you make your vision a reality. We’ve found that mycorrhizal inoculants help with transplant shock as well as re-establishing root systems. This paired with kelp meal and soluble micronutrients helps young trees get adjusted to their new soil. 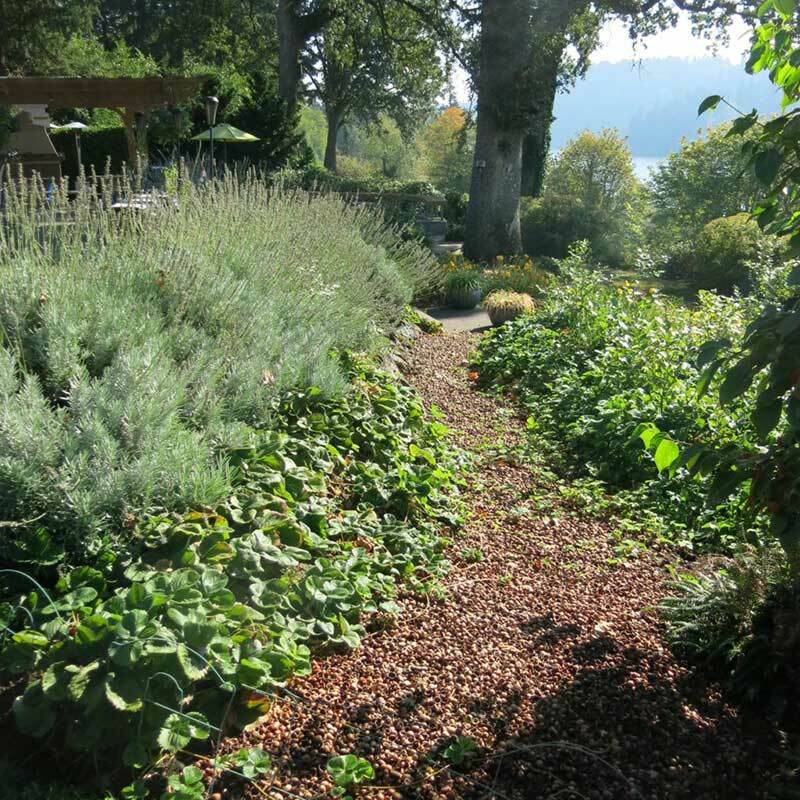 Organic fertilizers, such as those from Oregon’s own Concentrates Inc. and Sustane Organic Fertilizers provide plants with the nutrients they need to thrive while also feeding the soil. Biochar is a new product we’ve been experimenting with as it has great potential to act as a nutrient container and hold onto those nutrients that would otherwise easily wash away in our rainy winters. For legumes we use rhizobial inoculants to ensure that the beneficial bacteria are in contact with the roots from the moment the radicle emerges, and for Frankia associated nitrogen-fixers, such as those in the Elaeagnaceae family we gather small amounts of forest duff or soil from underneath healthy native Red Alder stands to ensure that the Frankia bacteria is present in the soil. We are constantly tweaking our approach based on the latest research and feedback we get from our plants and customers.